Gülsüm’s cousin, who had come to Christ years before, had helped her get a job at TÜRK-7, the precursor of SAT-7 TÜRK after her studies in Turkey and America. “It was either a big coincidence or a part of God’s plan!” Gülsüm exclaims. After working with TÜRK-7 for nine months, Gülsüm decided to pursue her career with several other production companies. However, nothing seemed to go according to plan. On a spontaneous trip to Cappadocia in Turkey, Gülsüm finally sensed God calling out to her once more. Keeping these burning questions to herself, she went to church and didn’t have to wait long for God to answer. Since then, she started to read the Bible again, “but this time with a changed heart”. Soon afterwards, she committed her life to Christ and, following the merger of TÜRK-7 with SAT-7 in 2009, she was asked to return to SAT-7 and start working as a Program Manager. Gülsüm has been producing Christian children programs, documentaries, women’s and youth shows for SAT-7’s Turkish language channel. No longer a tiny channel producing a few hours’ output a day, it is available 24/7 on the country’s national satellite TV platform. Through her experiences, Gülsüm says God has equipped her with the empathy and vision for her work at SAT-7. 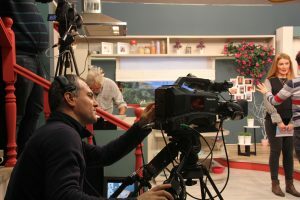 After years of seeking, she has found fulfilment with SAT-7 TÜRK, a channel that is in a unique position to share the Christian message in her culture.